The situation for many of us is that life is fast and full of opportunity. The complication is we think we have to do everything. The implication of this is that we make a millimeter progress in a million directions. My position is we can make a different choice. We can learn to recognize what is essential and eliminate nonessentials. If we do this then we can operate at a higher point of contribution. Below are five simple ways to simplify your life so you can focus on what is most essential. In the spirit of this, take five minutes to write down the most important six activities for tomorrow. Then cross off the bottom five. Write down your priority on a Post-it note and put it on your computer. 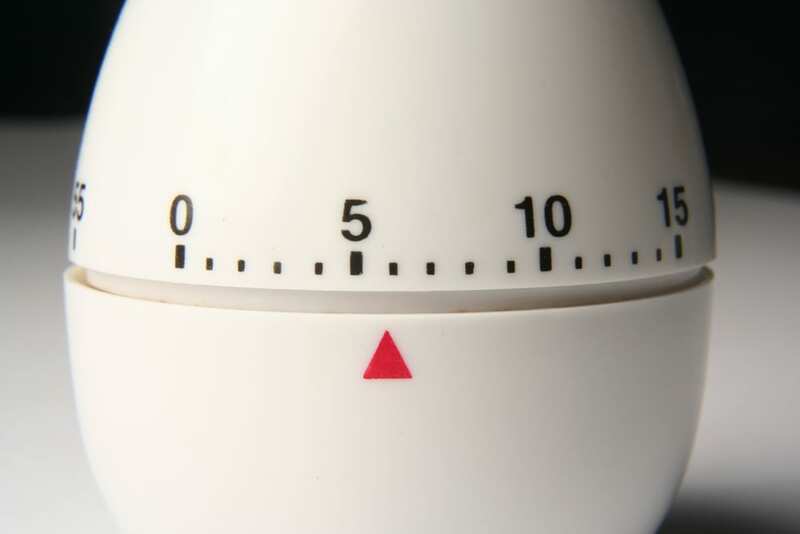 Schedule a ninety-minute window to work on that priority – preferably the first thing of the day. Pause once every hour for one minute to ask, “Is this the most important or valuable thing I could be doing right now?”If the answer is no, simply stop. Establish a new rule for one day: If you want to add a new activity you need to edit out two existing activities.This simple rule ensures two things. First, you don’t add an activity that is less valuable than something you are already doing. Second, it helps to ensure you move toward reducing your overall burden each day. Hold tightly to this idea if you are considering setting up any regular or repeated commitment and think long and hard about all the things you would have to give up in order to take this new thing on. There are a growing number of apps and services that do this. AwayFind, for example, sends an auto-reply that includes a way to contact you (in an emergency) through a text. There are three advantages: First the person has to decide if it is worth the extra effort, second you only have to respond with a text-message length reply, and third it ensures you can be found just in case something actually is essential. Think through tomorrow’s schedule from the moment you will wake up until you go to bed. Look at each activity. Identify any way you can make it a little easier through preparation. If you are planning to exercise, get your running clothes out so when you wake up in the morning, you won’t have to spend time digging through your closet. The idea here is to make doing the essential activity almost easier than not doing it. 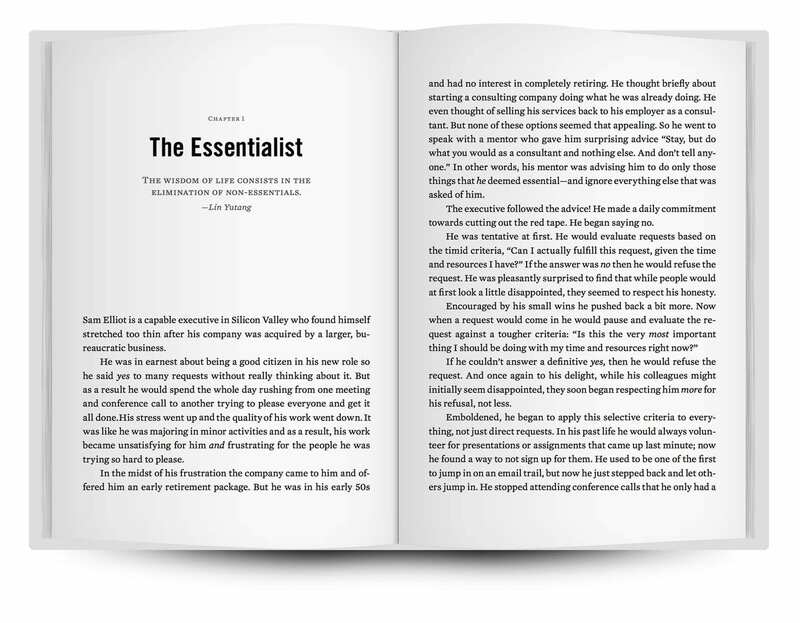 I encourage you to experiment with Essentialism. Prototype ways of working. Try out these ideas – and many others. Live by design rather than by default. Use what works. Eliminate the rest. Greg McKeown is the author of the New York Timesbestseller, Essentialism: The Disciplined Pursuit of Less. His “why” is inspiring people to design their lives and careers in order to achieve their essential mission. Pretty sure he meant take some time today, each day, to think about tomorrow’s day in full so that you can prepare. Every night before bed, perhaps, think through your day ahead and see if there is anything you can do to help stay on track, like the example he gave of setting out workout clothes. You might think about meals and what you can move from the freezer to the refrigerator to thaw, what errands you will run and what needs to be by the door to complete them. He didn’t mean all day today think about tomorrow. He meant for a short time today think about all you have to do tomorrow and what you can get ready. Great post Greg. Keep them coming. Thanks for these learning tips. Seizing a new day now with inspiration from you Greg. Wonderful post. We forget it’s the smallest activities that build up that can cause us stress. These are some excellent simple steps to declutter a day. Always looking to learn and to be reminded of how to stay on track with the important and not the urgent. Great post and very good advice. Be prepared always in your mind and take time to gather yourself so you focus on the true priorities of the day. There is always a better way to make life happen. Keep up the great post!